According to a letter from the Divisional Magistrate, Shekar, the Deputy Tahsildar (Elections) was posted 12 km away from the place where firing happened. Two weeks after the police force in Tamil Nadu’s Thoothukudi district opened fire on civilians killing 13 of them during the anti-Sterlite agitations, there is still no clarity on who gave the shooting orders to disperse the crowd. While it was initially revealed that the person behind the shooting orders was P Shekhar, the Deputy Tahsildar (Elections) in the district, new documents accessed by TNM reveal that Shekar was not posted anywhere near the area where the shootings took place. According to a letter from the Divisional Magistrate, dated May 21, 2018 i.e. a day before the police shooting took place, instructions were issued to various senior officials to safeguard the law and order situation on the following day. According to this letter, Shekar is posted at Fatima Nagar, Lions Town, Pudhu Street, Sorispuram, Thoothukudi Maadha Koil, Threspuram junction. In the FIR filed regarding the shootings, Shekar claimed that the protesters were warned through a public announcement system that tear gas shells will be used if the unlawful assembly did not stop. He also claims to have pointed out that Section 144 was in place in the area where protesters had gathered. 'When they didn't listen, I ordered for tear gas shells to be used. But the crowd continued to be violent. They began to attack the police with dangerous weapons and stones," the deputy Tahsildar says in his complaint. The protesters allegedly announced their intention to harm the men in uniform and were exhibiting the 'rage to kill'. "We warned the protesters that if they didn't disperse and continued the violent activity, we would have to shoot them. But they were increasingly becoming a threat to public life and property," he continues. Following this, the deputy Tahsildar claims that a bullet was fired into the air as warning. "But none of this had an effect. The group continued to be violent. Being patient after this would have resulted in great damage to public life and property. So I ordered for guns to be used to disperse the crowd," he says. This account makes it clear that Shekar was present in the area where firing took place. However, new documents have emerged which indicate that he was posted at least 12km away from the spot of the firing. Were the officers told to move? Why was Shekar not in his assigned post? These documents have opened up a whole new set of questions that are waiting to be answered. Additionally, Kannan, the Deputy Zonal Tahsildar is placed in charge of TNPCB office, junction of the TNPCB (Thoothukudi Madurai fourway lane), Railway, EB office (towards TNPCB office), Paddy Procurement Godown junction in Madathur Road as well as the Madathur junction. K Rajkumar Thangaseelan, the Special Tahsildar, is posted for duty at the collectorate office premises, the junction of collectorate office (national highway), junction of the district employment exchange office as well as at Sorispuram, according to the letter. 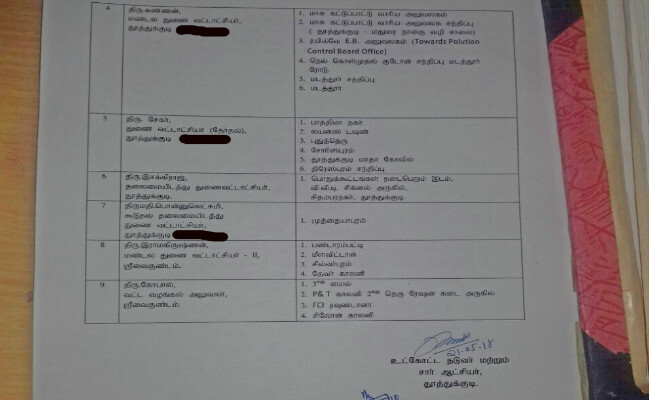 Further postings revealed by the letter include: Azhagar, another Special Tahsildar at Sterlite Industries, Thoothukudi, S Chandran, District Treasury Officer, at SAV Grounds, near the Old Bus Stand. Isakiraj, the Deputy Tahsildar (Headquarters) is posted at places where public meetings were to take place as well as near VVD signal and Chidambaram Nagar. Ponnulakshmi, Deputy Tahsildar (Headquarters), is posted to Mothaiyapuram. Ramakrishnan, another Deputy Zonal Thasildar is posted to Pandarampatti, Meelavittan, Silverpuram and Devar Colony. Gopal, Taluk Distribution Officer, is posted to 3rd mile, PNT Colony 2nd street, near the ration shop, FCI roundtana and Ceylon Colony.